See my small dog, Eloise? 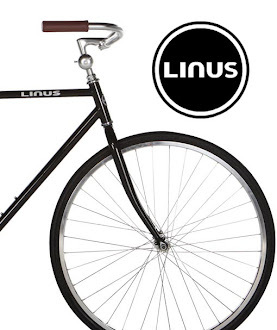 Welcome to Tool Storage Week at D+R. 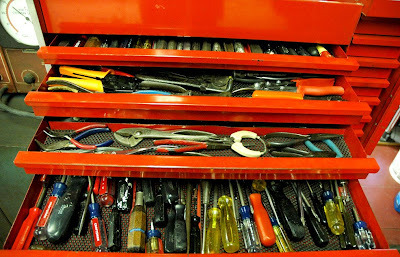 Each day, I will highlight another tool storage selection from the corporate collection of Hooptyrides, Inc. Since I am not an idiot, I knew I had a great number of toolboxes but a recent foraging trip around the shop revealed how deep the obsession had become. There is a rationale. Rather than storing stuff in milk crates or cardboard boxes, it is often sensible to keep like items in a single durable, easily transported toolbox. And that, ladies and gentlemen, is how you end up with a toolbox specifically for razors: X-Acto, single sided blades, linoleum hook blades, standard utility knives and box cutters. 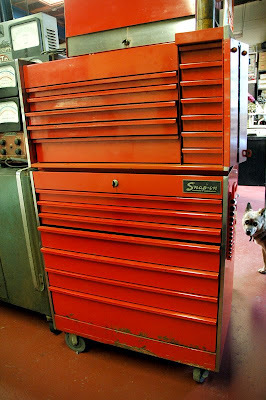 The toolboxes of my shop are in an orbit around the nucleus of the operation, the ubiquitous red Snap-On rollaway. Not only does this box sit at the center of the operation physically, it is also the emotional center of the shop as it was an inheritance. Although very organized, some drawers are admittedly too packed to be efficient. This is the damnation of the tool fiend - you can't find a 9/16" socket but are able to locate 3 different OBA sockets despite never owning a vintage British automobile. Now that I have an outlet to sell used tools, I have been mercilessly culling the collection to assure I have no more than three of each item.